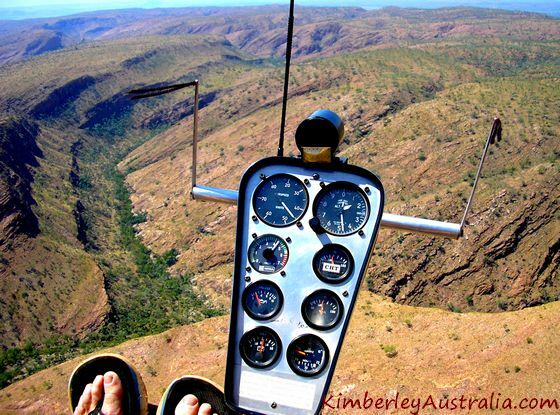 The Kimberley is such a rugged and remote wilderness, a lot of it can only be seen from the air. Scenic flights are popular and many different operators offer different packages for all tastes and budgets. I've never been much of a fan of scenic flights. They are too noisy and too far removed from the action, with the window glass separating me from the real thing. I prefer to see things on the ground where I can touch and hear and smell them, where I can experience them. But then someone introduced me to Stuart and I had a chance to go on a flight with him. Now that was truly a scenic flight of a different kind! 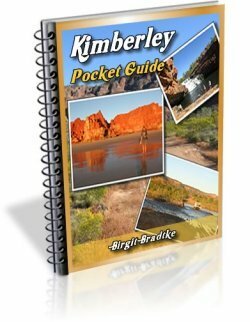 I loved it, and you will quickly understand why this scenic flight over the Kimberley is very different. This is it! 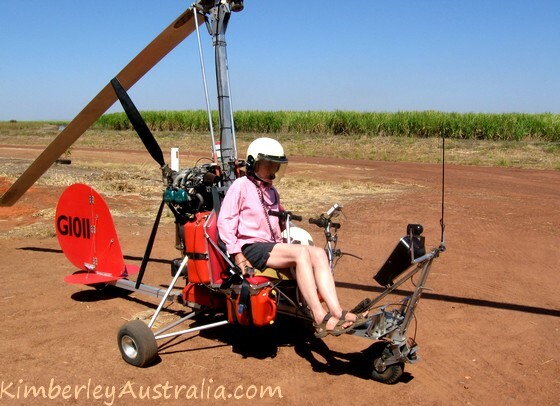 This machine is called a gyrocopter. It's best described as a double seat with three wheels, a lawn mower motor (not really, Stu hates it when I say that), plus a fuel tank strapped to the back rest and a propeller above your head. My mother might not appear overly confident in that photo but make no mistake: the lady has a sense of adventure. As you can see, our fearless pilot is checking his machine over thoroughly. Of course he has all the appropriate safety gear: seat belts, helmets... There is even a jerry can with spare fuel strapped to the passenger seat. We won't look any closer at the safety footwear but please do note the fancy cushion for extra passenger comfort. Mum is getting comfortable in her seat. Or not. 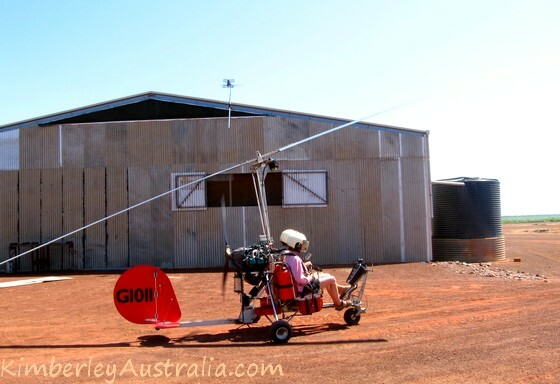 And off they go, heading for the airstrip behind the shed. 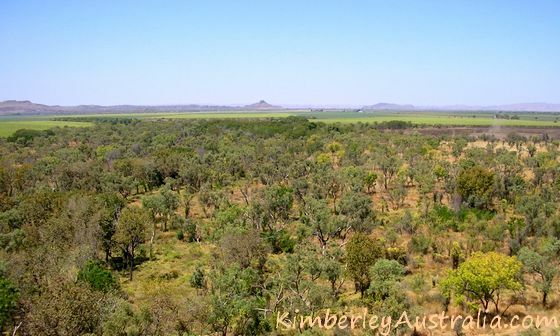 The strip is a graded bit of dirt, like most airstrips in the Kimberley. Don't expect any fancy airports out here. It really does fly! And it makes you feel like you're really flying. It will take some getting used to as there is no floor underneath you and no walls around you. You are also a lot closer to the ground than a plane would be. The view is amazing, the whole experience is amazing and exhilarating. 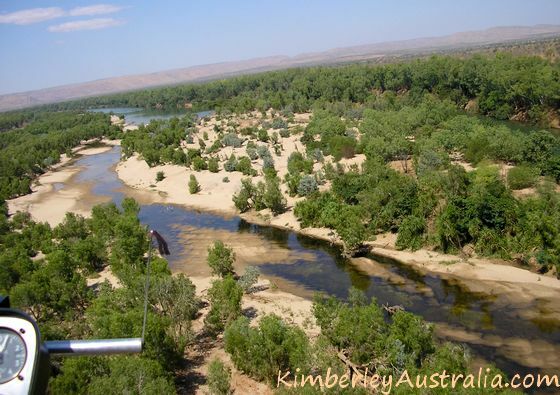 It doesn't compare to anything you have previously experienced in terms of scenic flights. The following pictures were taken by my mother during the flight. 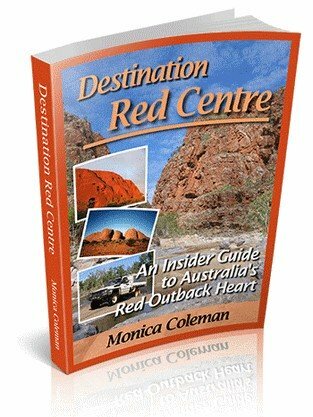 I had asked Stuart to head for the Ord River. 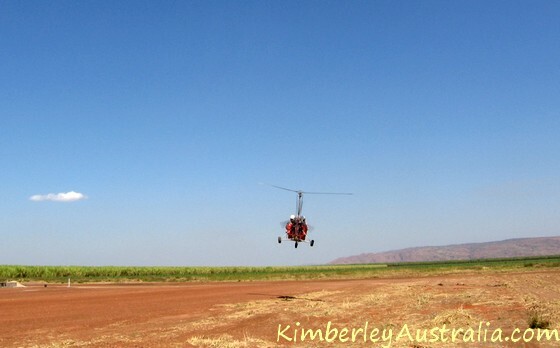 To get there from the airstrip he first needs to cross one of the many ranges. This particular one is called Deception Range. The toes in the picture are the pilot's, by the way. The flight was one of the first times my mother used her new digital camera. Sorry about all the gyrocopter parts, passenger parts etc. in the photos. 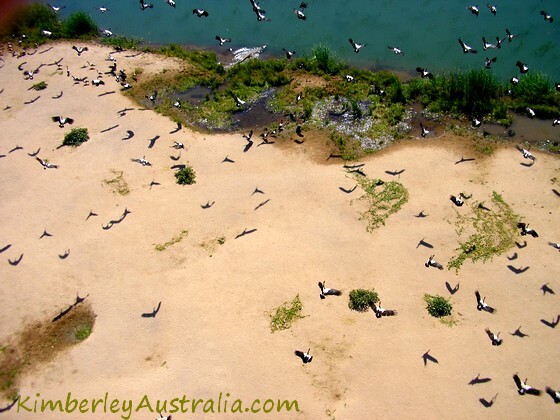 It is a paradise for waterbirds. 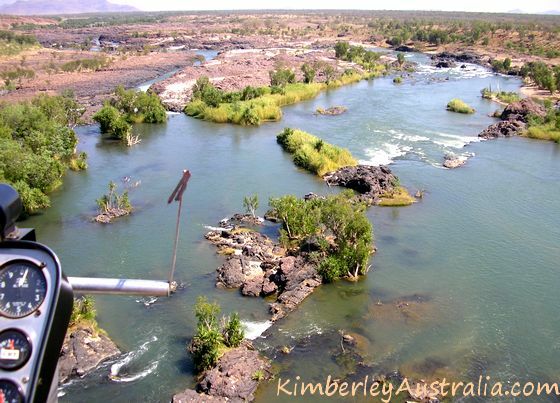 But then again, every body of water in the Kimberley is. 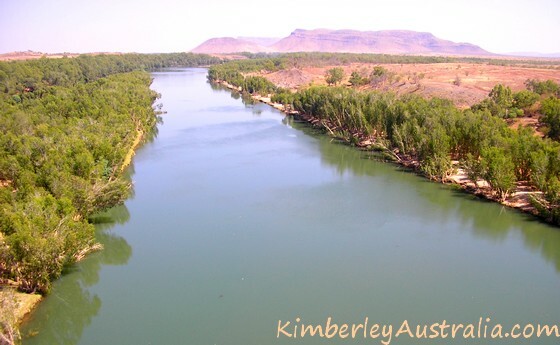 The whole Kimberley is a paradise because we have so much water here. This is the supermarket. It doesn't look like a supermarket you say? 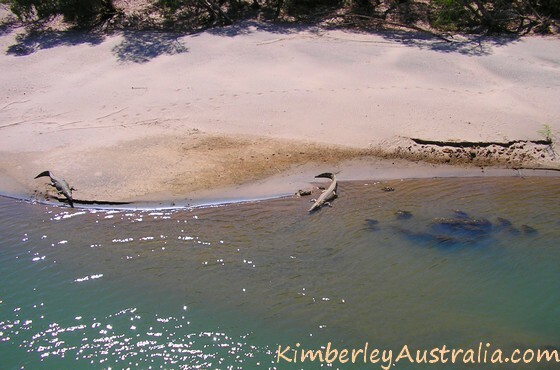 This rocky section of the river has lots of rapids and snags, and the barramundi love it. So the fishermen love it, too. Supposedly it's as easy to catch a barramundi for dinner here as it would be at the supermarket. Deep, slow moving water, preferably muddy, and sandy shores. 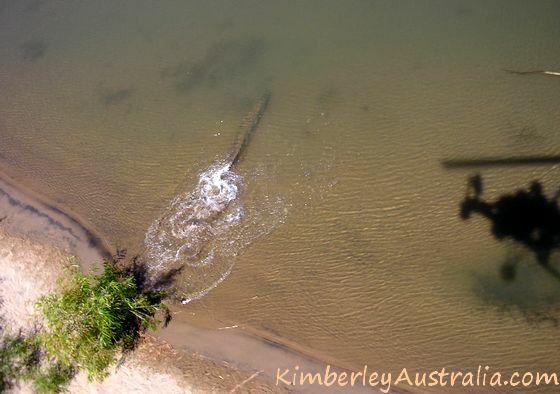 Saltwater crocodiles love that! A flock of Magpie Geese takes flight. 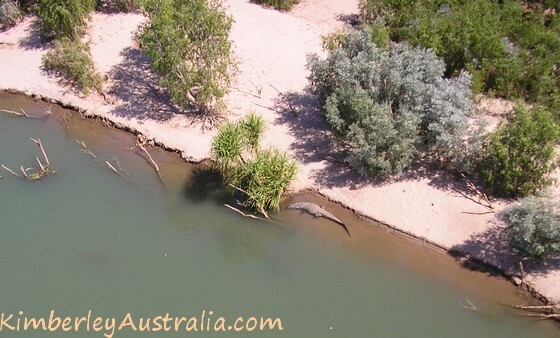 But can you spot the crocodile? My mother brought back stacks of (bad) pictures of crocodiles. 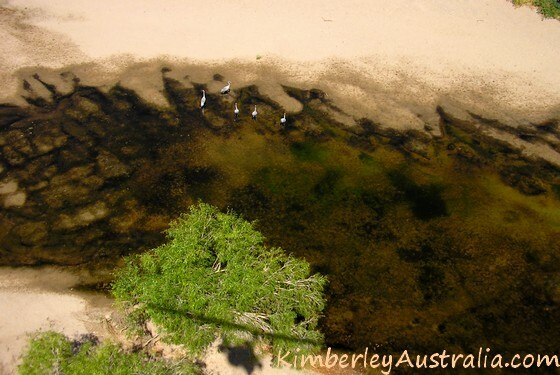 They are easy to see when you are in the air, but by the time you get close enough to take a good picture all you see is a muddy streak in the water. 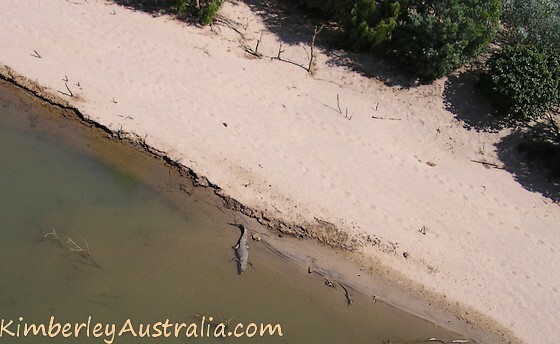 Saltwater crocodiles are very fast if they want to be! 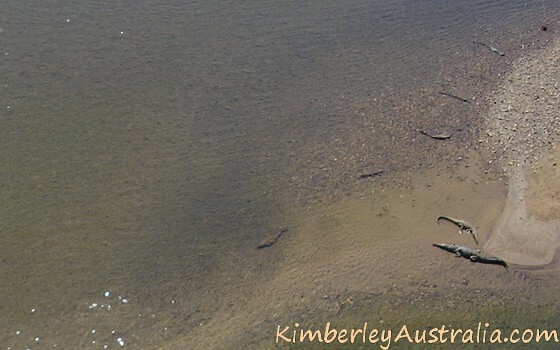 Yes, seven crocodiles in the one picture. We sure have enough of them! 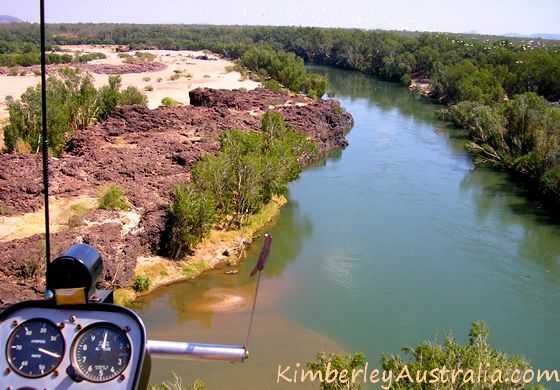 This is Ivanhoe Crossing, one of the many Kununurra attractions that most tourists will visit, albeit by driving there. 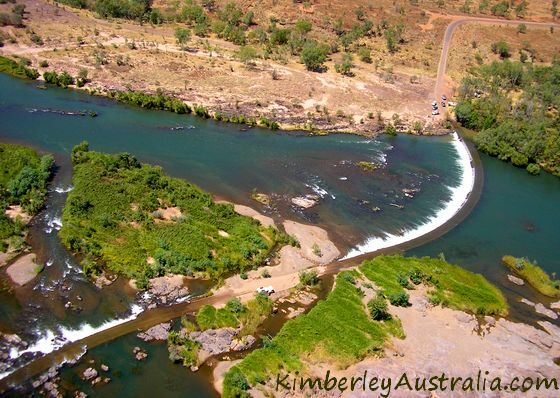 Ivanhoe is the place where the old highway from Kununurra to Wyndham crosses the Ord River. You can see a car approaching the crossing from the left, coming from the Wyndham side. 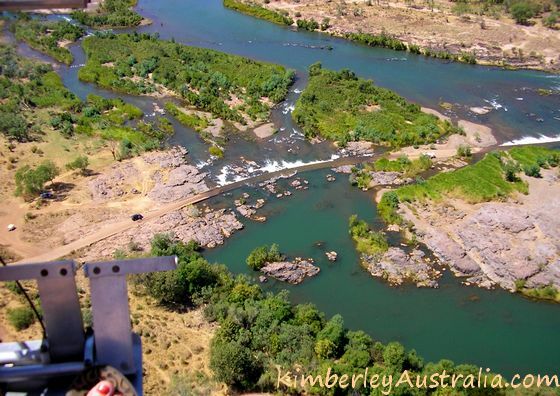 In the next photo you see the second part of the crossing and the cars parked on the Kununurra side. 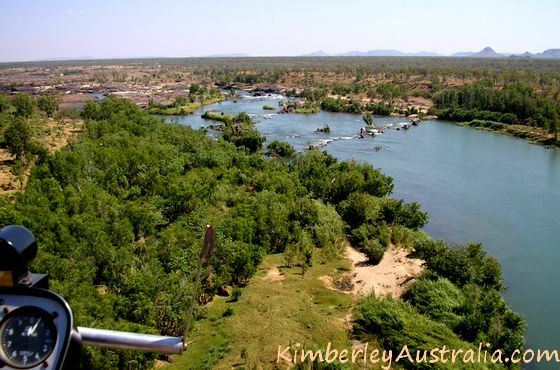 Ivanhoe Crossing is another popular fishing spot. 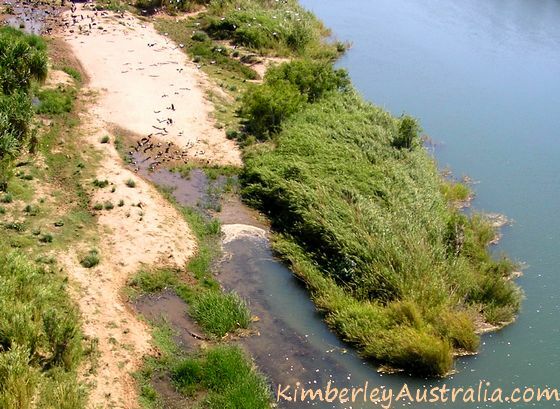 It's also a popular place for locals to hang out in the afternoons, have a swim (yes, although the crocs are only a bit further downstream), cool down and relax. And that was it. 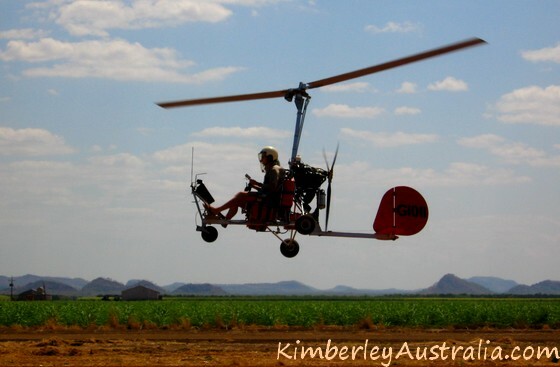 The gyrocopter is now making its way back to Kununurra. 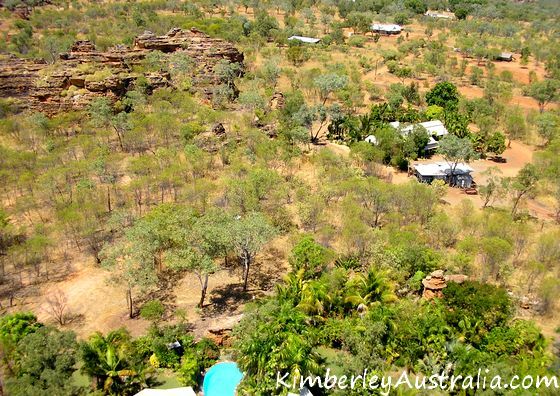 You can see Kelly's Knob (the lookout over the town) and Elephant Rock (located alongside Lake Kununurra) in the distance. 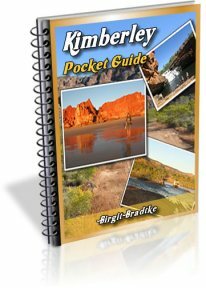 Kununurra sits in between the two. Not too shabby for a suburb, I'd say. Yay, they made it back safely! Of course they did. 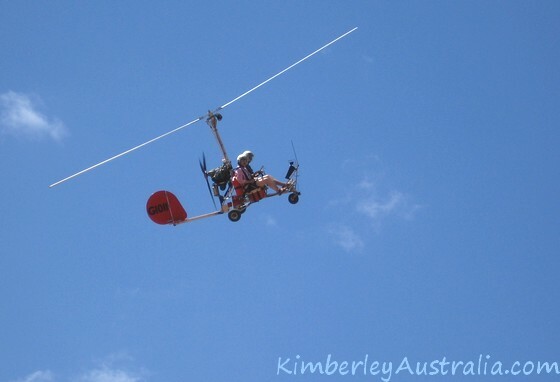 A gyrocopter might look somewhat flimsy but it is actually a very safe way of flying. 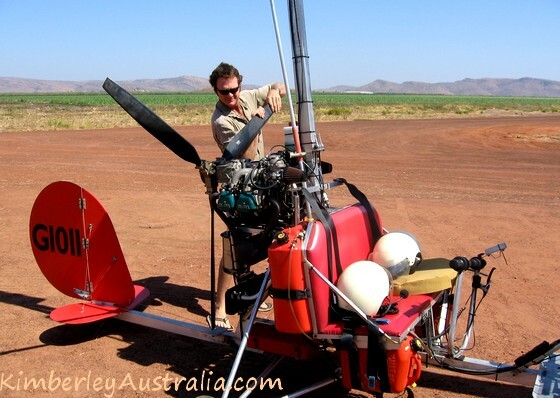 A gyrocopter would not drop out of the sky if the motor failed. It would sink slowly while still moving forward and the pilot has full control. But best of all, it needs very little room to land. A plane needs a lot of clear space to roll out. 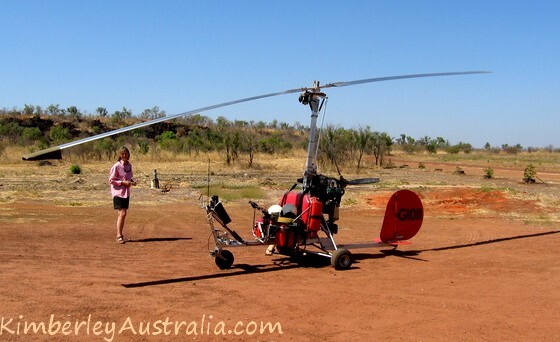 A gyrocopter stands almost immediately, the moment it touches the ground. It needs a lot of run up to start but only a couple of metres to land. 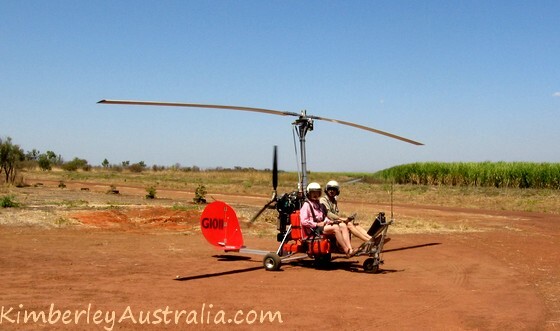 Gyrocopters have become really popular here in Kununurra. Quite a few people own one. Currently I don't know of anyone taking tourists on flights like Stuart used to do, but if I become aware of someone, I'll let you know! 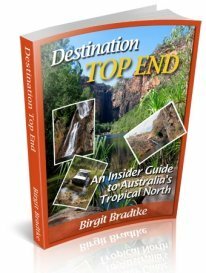 Read more about Kununurra and its attractions.